Colin Hanks, Kevin Spacey and Michael Shannon in "Elivs & Nixon." Photos by Steve Dietl/Amazon Studios & Bleecker Street. If you said Jerry Lee Lewis you are … wrong It was none other than The King! You know the one. That fateful rendezvous is chronicled in “Elvis & Nixon.” Director Liza Johnson's film is in its world premiere run at the 15th annual Tribeca Film Festival. It screens this evening and tomorrow afternoon. It opens widely in the United States on 22 April on Amazon and in theaters. A brief, impromptu meeting is a flimsy premise on which to hang a film. However, writers Joey Sagal, Hanala Sagal and Cary Elwes bring it off with aplomb. In the mouths of the actors, their dialogue snaps, crackles and pops. 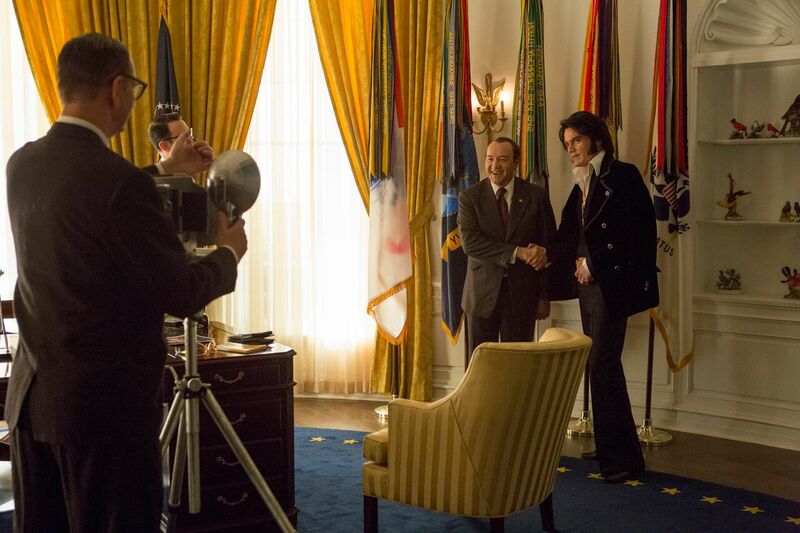 "Elvis & Nixon" is an occasion to enjoy the journey. Along the way we see both men preparing for their respective day. Elvis, played with an intense reserve by Michael Shannon, is in a Los Angeles hotel room not liking what he is watching on TV (protests, drug-using young people, Communist marches and various governmental denunciations, etc.). Consequently, he turns the TV off. That is, he shoots the TV with one of the handguns he is legally licensed to carry. Elvis is armed to the teeth, or is that the feet? Meanwhile, in the nation's capitol, POUS is cheerlessly getting his day organized. Because the meeting is going to happen on this day, titles on the screen keep viewers apprised of the time. After sorting out the TV, a disgusted Elvis and his weapons take themselves off to LAX. He is met by his friend, Jerry Schilling (Alex Pettier) and off they go to the nation's capitol to take an unscheduled, unplanned meeting with the most powerful man in the world. There are many laughs in "Elvis & Nixon" and many of them revolve around the reactions of ordinary people to Elvis. Invariably, the people whom Elvis encounters are initially unsure whether they can believe their eyes. He is out of context. One should see him on the movie screen or concert stage, not walking alone into the airport with no luggage. Or walking into a diner unaccompanied. Where is this man's entourage? He cannot be allowed to walk around as if he were a nobody. Two of the funniest encounters take place in the airport with an Elvis impersonator and at a black diner in Washington, D. C.
Each scene in "Elvis & Nixon" advances the viewer closer to the meeting. It's akin to watching a chess match. Strategy is key in almost every encounter, starting with Elvis dropping by the White House with a letter for the president. As Richard Nixon, Kevin Spacey is by turns spot-on and the veriest caricature. Always, however, he is hilarious, deftly capturing that chip-on-his-shoulder, inferiority-complex mien that defined Nixon much of his life. Elvis Presley (Michael Shannon) and flygirls in "Elvis & Nixon." Among the funniest moments in the film are the scenes in which the handlers of each man are setting the parameters of the meeting, which was ultimately brought to pass by a certain persuasive young woman. During their chat the two men discover that they have a few things in common. By its conclusion they are new BFFs. It was a good meeting — for Elvis, anyway; he got his badge. Not so sure about Nixon. 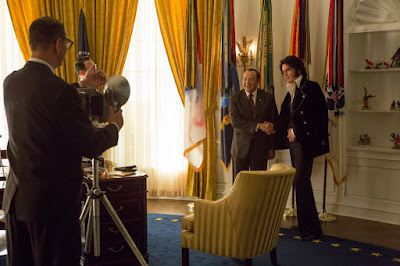 It is hard not to leave "Elvis & Nixon" with a smile on your face and a laugh in your belly. Other films/events on today's TFF2016 schedule: Virtual Arcade, "Little Boxes," Don't Look Down," "Abortion: Stories Women Tell," Shorts: Pressure Points," "Keepers of the Game," "Kicks," "Untouchable," "The Devil and the Deep Blue Sea," "Children of the Mountain," Betting on Zero," "After Spring," "Team Foxcatcher," "Tickling Giants," "Equals," "Live Cargo," "The Human Thing," "Vincent N Roxxy," "The Meddler," "Robert Klein Still Can't Stop His Leg," "Equity," "Do Not Resist," "Haveababy," "Lavender," "Nerdland," "A Kind of Murder," "Midsummer in Newtown, "Don't Think Twice," "The Banksy Job," "Dreamland," "Between Us"